It's wine o' clock! That can be at 6pm during the week, or at 1pm on a weekend during lunch time. Or the other way round. French people love wine and rightly so, because their wines simply are one of the best in the world. Wine. An essential thing in the life of a true Parisian. Whether red, white or rosé that doesn't matter as long as you pair it right with the food and the right company. A big difference between Paris and other cities is that no matter what day it is, you leave your apartment late in the evening and you'll find people sitting, chatting and laughing outside over a glas of chilled white wine or rosé in the summer. In winter, red wine seems to be an accessory to many dishes, but feel free to have a glas in summer, too. And no matter in which arrondissement you currently are, you'll always find a nice, little shop where to find a good bottle of wine. 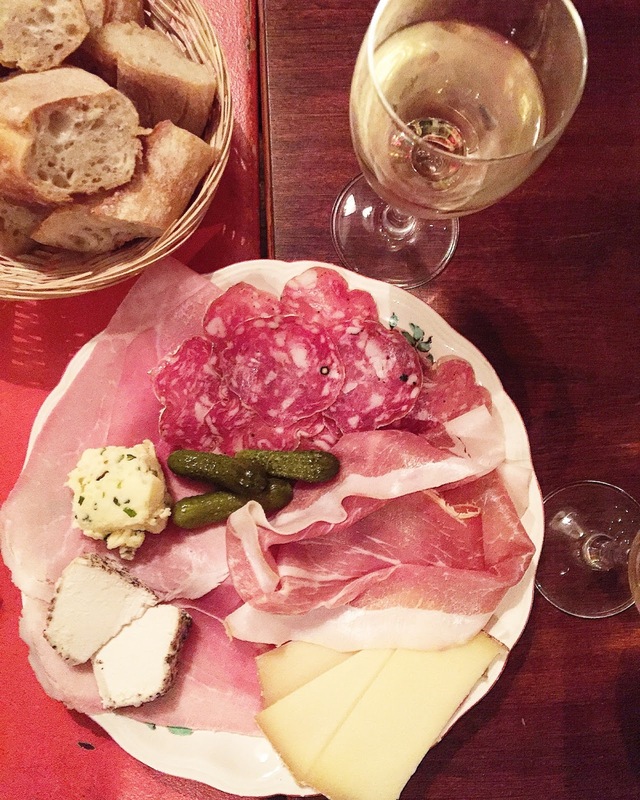 So here comes a list with 10 wine bars in Paris that I have been to and that I have really liked. Some of these places are more expensive, some are more 'bon marché'. Some are more posh, some less. Some have better wine and some less. I haven chosen these places, because I liked the overall atmosphere and because wine and/or food were matching with my expectations in that particular moment; so some people might disagree with my choice, but I think that all of these places have all it takes, or most of it, for a nice evening. Be it one with friends, one to show to your parents or one for the perfect rendez-vous, you'll find everything in my little list below. I didn't have photos for every place - sorry for that! As mentioned in last week's breakfast guide for Paris, there is three Frenchies; this wine bar, a brunch place and a fancy pants restaurant. The wine bar opens at 7pm and that is the time you should be there. It's a popular place that fills up quickly, so be early to save yourself a seat. The wine bar is know for its great selection of wines, starting with around 23€ per bottle and ending somewhere far over my budget. The waiters are a bit impatient, but are happy to recommend and help you with making your choice. And that's not it, the food here is a must-try, too. Me and my friend shared the homemade tortellini, the pâté and in the end there was a huge piece of lemon meringue cake. GOSH! Whom you should bring here? Well, it doesn't really matter; this place is perfect for a relaxed evening with your parents, a girls/boys night out, or a date. Price Range: wine bottles start at around 23€ dishes range from 9€ for a small one and 18€ for a bigger one. 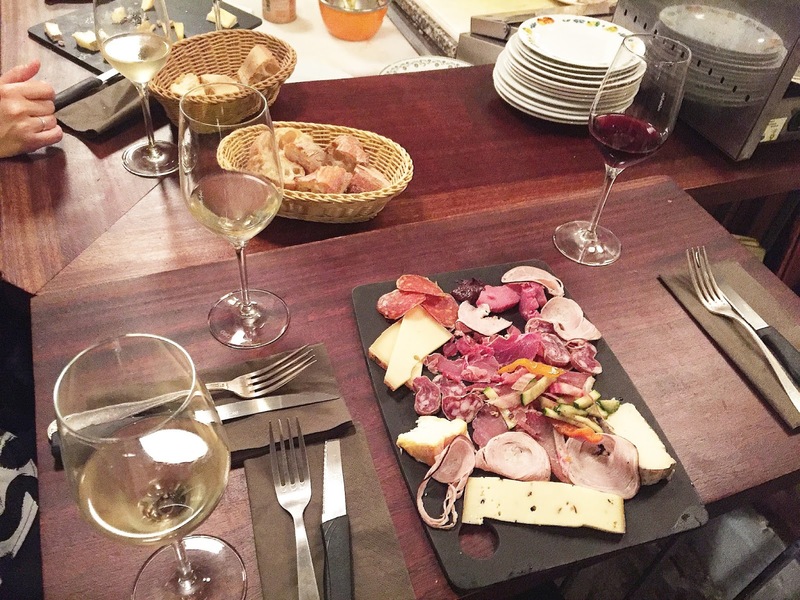 Also located in the 2nd arrondissement, this place offers a small number of open wines and a big range of wine bottles. The charcuterie platters are great; saucisson, ham, cheese, all fresh and full of taste. The interior is rather traditional, with a lot of wood and a big shelf, where wine bottles are draped. Make sure to reserve a table, unless you're fine with sitting at the bar, which is nice too, but depends with whom you're there and how many you are. They also offer smaller dishes, like bruschetta with homemade spreads. Not to forget: next to it is a supposedly great restaurant that is still on my to-do list: 'Racines 2'. Price Range: Around 6-8€ per glass, 14€ for charcuterie. Without my roommate Maxime, I might have missed this cosy, home-like place: couches, old big bar tables and stools ...and very nice waiters. Packed on weekends and a bit less people during the week, you should come here to have a good time with friends. It's always good to reserve a table, especially if you're a bigger group - to be on the safe side. 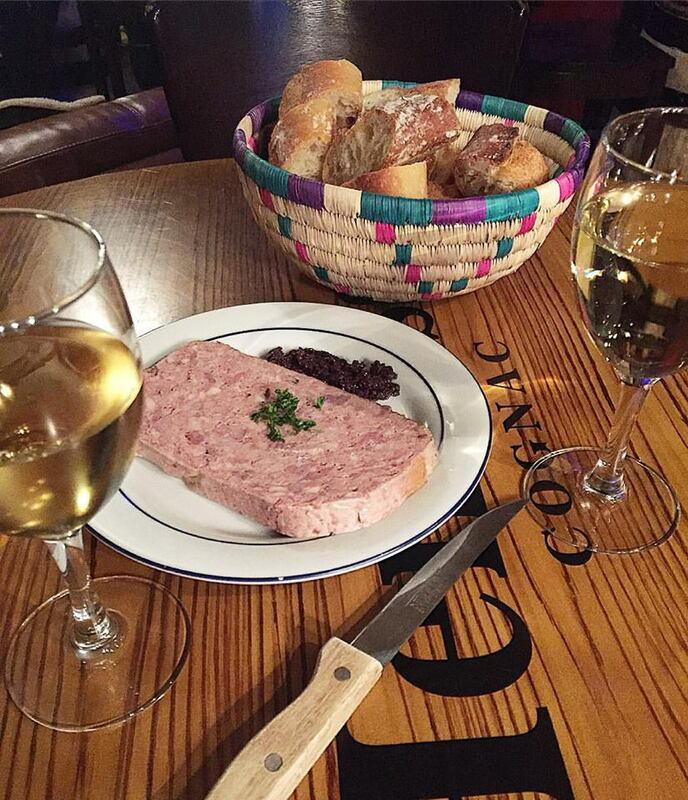 The bar offers wines per glass for a small price and also different small bites, like pâté or different kinds of cheese. If you're craving for more, a few steps further down the street there is Mémère Paulette, the restaurant matching with Pépère Jean. Price Range: Around 5-8€ per glass, 14€ for charcuterie. I've mentioned this place already one year ago in my Paris Travel Guide. There are two 'La Patache' - The wine bar and the restaurant are two different places located next to each other, with the restaurant having different opening hours, serving dinner from 19.30h onwards. The wine bar offers a happy hour from 16:30-20:00h. The house wines are simple but all at 4€. There is also charcuterie platters with delicious ham, cheese and pickles that go perfectly with the different wines. Price Range: Around 5-8€ per glass, 4€ during happy hour, 14€ for charcuterie. I have been here only once or twice for a drink (preferable wine) and the choice I made was always good. It's located right next to Canal St Martin, so perfect for a little Apéro when it's summer or early autumn and still warm outside. The waiters are nice, but a little stressed and the food that is served here always looked nice when I had a glimpse on my neighbor's table. This buzzing place is the perfect location for a night out with friends, cheap wine (maybe not the best one, but it's quantity over quality here) and a nice, traditional, classic interior. You don't need to make a reservation, as you can stand at the bar or somewhere else, while enjoying a good chat with friends. It can get quite packed here, so don't be mad if you get a little push from the right or left. And if you get mad, there is always plenty of other bars that you can move to on the same street. Another wine bar that I've discovered thanks to my roommate, when I lived in the 11th. A relaxed wine bar, located at the corner of a street, not immediately remarkable from the outside - at least I managed to walk by several times, without noticing it. 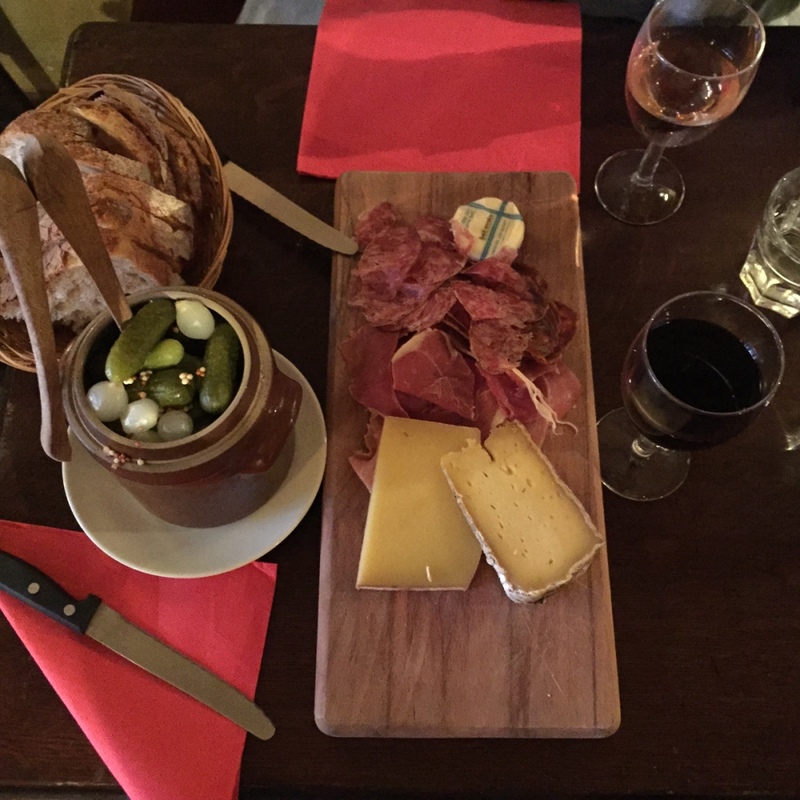 The waiters are easy-going and nice, wines are good and well priced and the fresh baguette and charcuterie platters are tasty, too. They have some seatings upstairs and some downstairs and it's not an overly crowded place, but can become full quite fast, so don't arrive too late. I've been to 'La Buvette' only once (well, twice, but the first time they were already closing), and everyone seems to know each other there, a big family in that tiny place. It is basically one room with some seats at the bar and around 3-4 little tables where you can sit and enjoy all kinds of wine. They also have a number of bottles that you can buy here and take home. You can also order small bites, like a traditional French saucisson, thick, marinated white beans and other simple but delicious things. This, is also one of the places that is filled quickly, so be early, also, because the bar closes at 10pm, already. 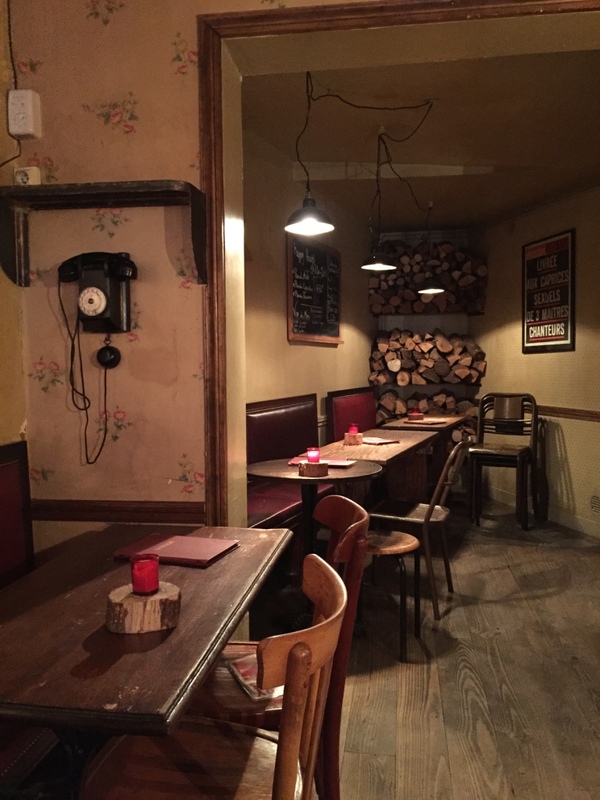 A little restaurant/wine bar in the middle of the buzzing Oberkampf area, with a nice, cosy interior with dimmed light and some tables, where you can sit and talk over a nice glass of wine. They have live music and DJs from time to time and if you get bored by this place, you can head over to 'La Mercerie', the bigger sister of this one. It can prove quite hard to find a nice, not too touristy and overpriced bar close to Sacré Coeur in the Montmartre. This bar isn't any of it; it's nice, atmospheric and fairly priced. The only thing is that waiters are a bit cold, but the French way, so they don't actually mean it. The interior is very light, wood-dominated and a bit hipsterish. What's also nice, is that right on the opposite side of the street you can find a small, nice theater; so why not enjoy some culture first and then end the night with a nice glass of wine. For the hungry ones: they serve Tapas, too!